Thursday nights are always my take-out night. I’ve nearly made it to the weekend and all I want to do is enjoy a really delicious meal and a glass of wine, and my weeknight standard meal just doesn’t usually cut it! 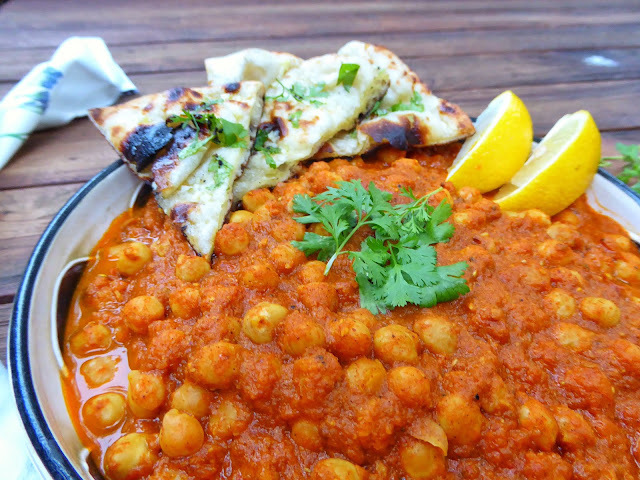 I love Indian and Thai cuisine especially, but I was always really intimidated by the thought of trying my hand at it…until I did! 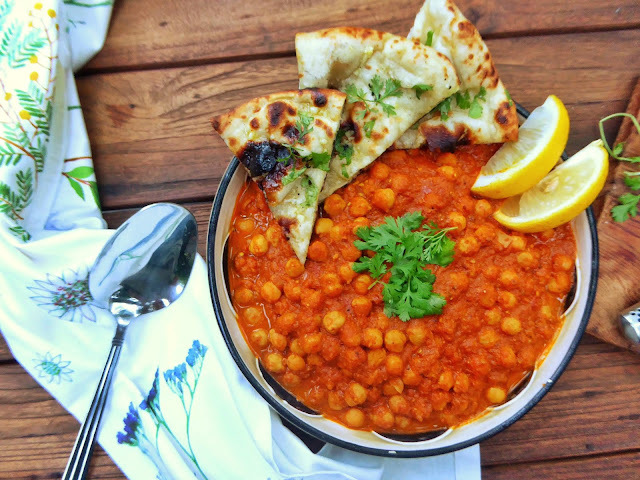 My version of chana masala (chickpea curry) is so easy to make, cheaper than takeout, and honestly SO delicious I can hardly believe I made it myself. Not only that, but cooking your own dishes is so much healthier than getting take-out. You can control exactly what goes into it, which is way less fat and salt than what a restaurant would normally use. 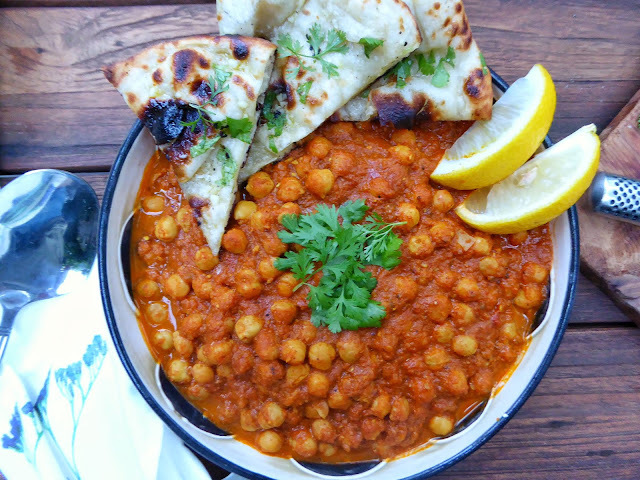 Chana masala is a chickpea curry, but it’s just as hearty as any meat dish, and the benefits are endless. 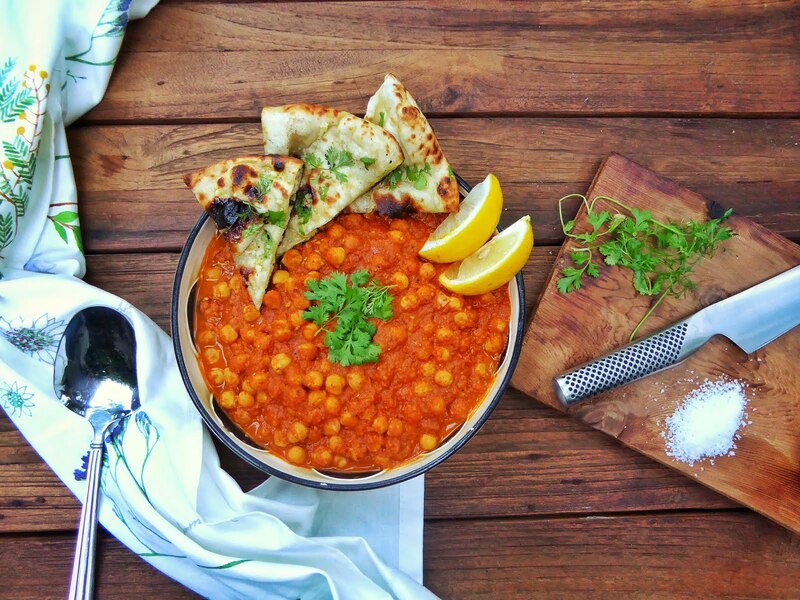 Chickpeas are a huge source of dietary fibre (great for heart health) and protein, so you stay feeling full. Some people find chickpeas a little bit bland, so if so, this is the recipe for you to try! I add tons of delicious Indian spices and flavours to brighten up these little beans and pack them full of flavour. The base of this curry is a tomato sauce. I first soften up some onions and garlic in a pot with all of the spices, and then add the canned tomatoes. Blend it up with a hand-blender to remove some of the chunks but also really meld the flavours together. Add the chickpeas and let stew. Seriously, it’s as easy as that! 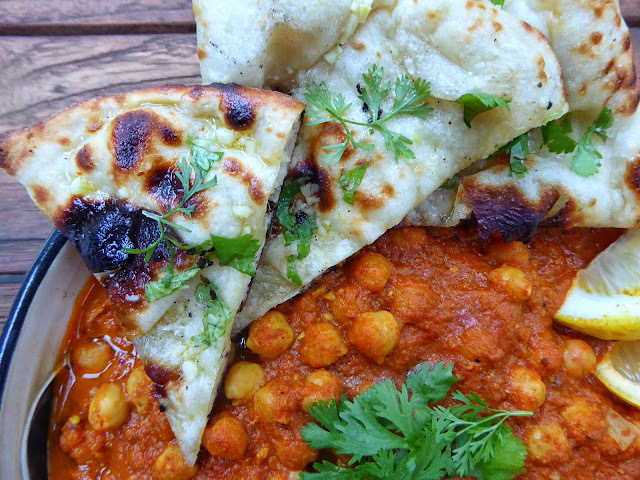 This can be served with some grilled naan bread (I pick up some on my way home from a local Indian restaurant, but the store-bought stuff is pretty good if you grill it and top with some garlic oil and fresh coriander. I know, I’m cheating a bit. But on a week night, I don’t have time to make fresh naan bread!) or basmati rice.  See here for basmati rice cooking method. No need to order in tonight! Enjoy this really simple but super flavourful curry at home and save that cash for your next night out! This chickpea curry is hearty, packed with flavour, and impossible to stop eating! Place in serving dish and garnish with cilantro and lemon wedges. Enjoy! Garnish with coriander and enjoy! *If you do not have a hand blender, no problem! You can combine the tomatoes, garlic, ginger, onion and hot pepper in a food processor or blender before cooking so that you’re not pouring burning hot stuff into your blender. Add the wet ingredients to the pot after toasting the spices with the oil.